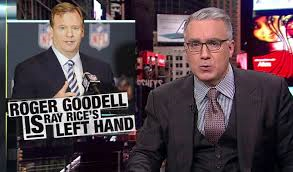 (Huffington Post) --- When Keith Olbermann sees NFL Commissioner Roger Goodell, he will only think of one thing: Ray Rice's left hand. The ESPN talk show host eviscerated Goodell during an impassioned rebuke of the many parties responsible for mishandling the punishment of Ray Rice following his domestic violence arrest in February. Olbermann called on Goodell to resign from his post or be removed by team owners in segment that aired on Monday. The call for Goodell's resignation or ouster came just hours after the Baltimore Ravens released the veteran running back and the NFL announced that he had been suspended indefinitely. Both moves came only after TMZ released a video showing Rice striking then-fiancee Janay Palmer in an elevator during a February incident at a casino in Atlantic City, N.J.
"Mr. Goodell's ineptitude has not merely rendered this football season meaningless and irrelevant by contrast, it has not only reduced supporting or watching NFL football to a distasteful even a disrespectful act, but most importantly it has comforted the violent and afflicted the victim," Olbermann said. "His push to increase NFL punishment of domestic abusers to roughly one-third that of repeat pot smokers, his decision today to suspend Rice indefinitely after the Ravens had fired him are elements of classic tragedy wherein the right thing is finally done only after it is too late to matter. Roger Goodell's existence, who he is, what he has turned the NFL Commissioner's office into is now symbolized by Ray Rice's brutal left hand striking Janay Palmer, and striking her again. Mr. Goodell is an enabler of men who beat women. His position within the National Football League is no longer tenable."